M.H. Dyer began her writing career as a staff writer at a community newspaper and is now a full-time commercial writer. She writes about a variety of topics, with a focus on sustainable, pesticide- and herbicide-free gardening. She is an Oregon State University Master Gardener and Master Naturalist and holds a Master of Fine Arts in creative nonfiction writing. Carrot seed oil is an amber-colored oil extracted from carrot seeds by a steam-distillation process. The oil has a high level of antioxidants that may help to prevent damage caused by free radicals that can harm healthy cells. Carrot seed oil is used in many skin care products and is especially effective for dry, sun-damaged skin or mature, wrinkled skin. Carrot seed oil can be purchased at herbal supply stores and can be used in a number of homemade beauty treatments. Talk to your doctor before using carrot seed oil to treat any skin condition. Place 3 tbsp. aloe vera juice, 3 tbsp. liquid Castile soap and 3 tbsp. sunflower oil in a small plastic, flip-top bottle. Use commercial aloe vera juice, which will contain a mild, non-toxic preservative. Add 3 drops carrot-seed essential oil, 3 drops geranium essential oil and 1 tsp. vegetable glycerin. Shake well. Wash your face with warm water. Smooth about 1 tbsp. 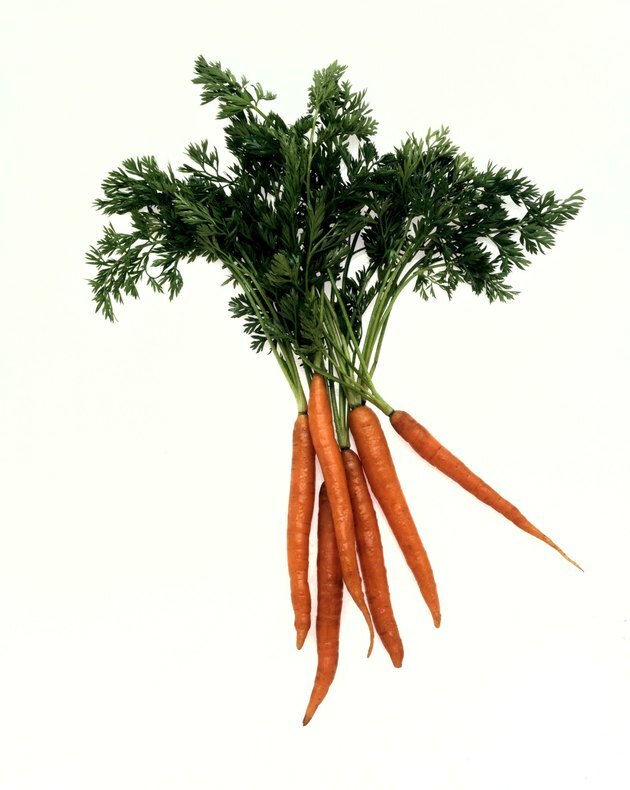 of the carrot seed cleanser into your skin until it forms a lather. Rinse with warm water. Place 2 tbsp. carrot seed infused oil and 2 tbsp. sweet almond oil in a small plastic bottle. Add 15 drops carrot seed essential oil, 10 drops frankincense essential oil and 5 drops geranium essential oil. Shake well. Place a few drops of carrot seed oil make-up remover on a cotton ball and smooth the cotton ball over the skin. The make-up remover can also be used as a cleanser or moisturizer. Place 2 tbsp. hazelnut oil and 2 tbsp. rose hip seed oil in a small dark-colored glass bottle. Use a glass bottle with a dropper in the lid. Add 5 drops carrot-seed essential oil, 5 drops calendula oil, 5 drops lavender essential oil, 5 drops rosemary essential oil and 1 tsp. vitamin E oil. Shake well. Wash your hands, then place a drop of the oil on your fingertips. Massage the oil into scars or into dry, sun-damaged skin. Place 1 tbsp. Jojoba oil,1 tbsp. calendula infusion oil and 1/2 tsp. carrot seed oil in a small, dark-colored bottle. Add 10 drops lavender essential oil, 6 drops clary sage essential oil, 4 drops cedarwood essential oil and 4 drops rosemary essential oil. Shake well before each use. Massage the oils into your scalp to treat hair loss or dry, itchy skin. Allow the oil to remain without rinsing it out. Store the oil in a cool, dark place, where it should keep for about a year. It's important to note the difference between essential oils and infused oils. Essential oils are distilled from the carrot seeds and are highly concentrated. Infused oils are made by steeping plant parts in warm oils such as vegetable oil or olive oil. Keep carrot seed essential oils away from pets and small children, as the oil can cause skin irritation, nausea and vomiting. Avoid using carrot seed oil if you are pregnant or if you have epilepsy. Is There a Homemade Way to Grow Hair Faster in 2 Weeks? Can You Mix Tea Tree Oil With Aloe Vera Oil to Treat Acne? Are There Natural Remedies to Remove Spider Veins on Face?